For the second consecutive season, FIU will be going bowling as the Panthers face Toledo from the Mid-American Conference in the Makers Wanted Bahamas Bowl at 12:30 p.m. on Dec. 21 at Thomas A. Robinson National Stadium. 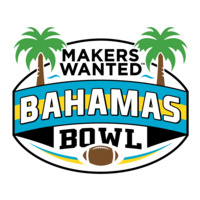 The game will be televised on ESPN and broadcast on the Makers Wanted Bahamas Bowl Radio Network. Tickets to the 2018 Makers Wanted Bahamas Bowl can be purchased through the FIU ticket office on Monday, beginning at 10 a.m. For those wishing to purchase tickets online, go to FIUSports.com, call 305-FIU-Game or click here. All U.S. citizens who wish to attend the game must have a valid U.S. Passport. Please check FIUSports.com early next week for travel packages.